By Firefighter Gary Cornell. Originally published in the Sesquicentennial 1834-1984 East Liverpool, Ohio Souvenir Booklet. The Department's history dates back to 1877, when the first firefighting organization was formed in what was then a village of 3,000. It's name was the Crockery City Hook and Ladder Company, and it consisted of Captain Robert Hauge, Lieutenant William Chisholm, and 50 members. The equipment consisted of a wagon filled with buckets. The wagon was housed in a shed at the City Hall, at Third and Market. The Department was given the use of the Street Department's horses, when they were not using them. The construction of the Water Works in 1879, was a boon to the Fire Department. So soon after this a hose reel, and several hundred feet of hose were bought. This gave some measure of protection, to those places that had water lines and hydrants. 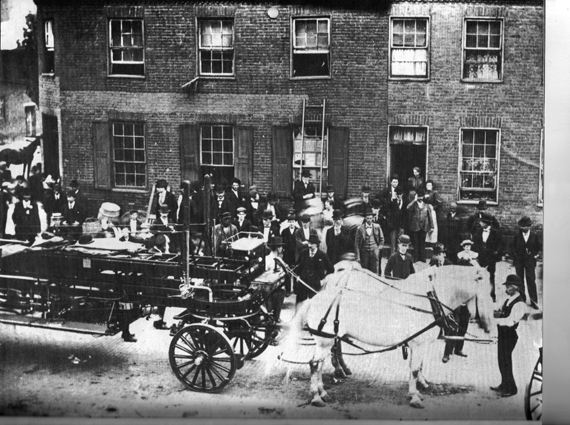 In 1886, Council bought a team of horses to pull the apparatus since pulling it by hand sometimes caused it to be upset, causing a delay. In 1893, City Council realizing the need for a uptown building to follow the business trend, purchased from Frank Dickey, his livery stable at Broadway and St. Clair. The building was purchased on July 29th, for $7,000 and extensively remodeled for the sum of $900. The station opened on November 27th, and was marveled at by all who saw it. The new station housed the Silsby pumper, the old hose wagon, and the aerial truck, purchased for $2,600 earlier that year. The Insurance Underwriters told the City in July of 1893, that the Volunteer Department was no longer able to handle the job. They said the City needed a paid Fire Department. So after much debate and public pressure a partial paid Department began December 13th 1893. It was made up of three full time men Captain H. Clinton Morley, Joshua Curfman who operated the Silsby, and Driver James McCullough. These men were paid $50 a month, while Fire Chief Bart Adams made only $15, and the Volunteers made $5 a month. In addition to the full time men, three men were paid $10 a month to sleep at the station every night. They were Barney Peterson, George Betteridge, and H.M. Deitrick. The City said they would start a fully paid Department in the Spring or Summer of 1894, but it was May 12th 1896, before they did. On April 28th, 1896, City Council passed Ordinance - 492, which provided a paid Fire Department. Captain H. Clinton Morley was named Chief when Bart Adams turned the job down, because of the long hours that had to be spent away from his family. In those days the men worked six 24 hour shifts in a row, they then got one day off. They did get one hour off for each meal however. On May 12th, Chief Morley named the other members of the new Department. They were Asst. Chief James McCullough, 1st class Firefighters Thomas Bryan, William Terrace, H.M. Deitrick, and Elmer McMillen. The 2nd class Firefighters were Barney Peterson, and George Betteridge. Joshua Curfman was chosen by Morley but had to be replaced by Peterson, because he was passed the 50 year old age limit. The Chief made $780 a year while his Asst. Chief made $660. The 1st class men made $600, and the 2nd class men $540. Because of the growth of the East End, a sub station was built on Virginia Ave. It opened on November 4th, 1898 with William Terrence in charge as it's Captain. It was a two story frame building. The site is now an empty lot. On December 24th, 1900 the Fire Department suffered it's 1st death, John Hamilton was electrocuted while fixing a street light on Mulberry Street. On February 28th 1905 East Liverpool saw it's first major fire. The blaze destroyed the entire corner at Fifth and Market Streets. The neighboring towns sent their fire departments to help fight the fire. The departments of Rochester Pennsylvania, and Steubenville Ohio, arrived on special trains sent to bring them. The fire caused almost $700,000 damage but only about $300,000 insurance was paid. The City continued to grow, and on August 1st, 1906 the Northside Fire Station opened. It is the two story brick building at the corner of St. Clair and McKin-non Ave. William Ruhe was named Captain. The Station closed December 29th, 1968. The year 1907 was one of tragedy for the Department. Firefighter Charles Rose died of pneumonia on February 14th. On March 22nd, Firefighter George Betteridge fell to his death, while fixing the fire alarm lines on Dresden Ave. near the Horn Switch. Also Chief Morley suffered a fatal heart attack on September 3rd while fighting a fire in the Wright Meat Shop, on Dresden Ave.
Asst. Chief James McCullough was named to replace Chief Morley, on October 17th. Thomas Bryan was named Asst. Chief the same day. A new Fire Station was opened in the West End, on March 1st, 1908. It is the two story brick building at Lisbon and W. Ninth Street. The station was closed on July 16th, 1918. Patrick Woods was the Captain. Things went smoothly until February 10th, 1912, when Chief McCullough was suspended for gross neglect of duty. There is some evidence that this may have been political in nature. He was reduced to the ranks, and died of blood poisoning a year later. McCullough was replaced by Arthur S. Aungst, who was the Fire Chief in Alliance Ohio. Aungst took over on May 9th, 1912. 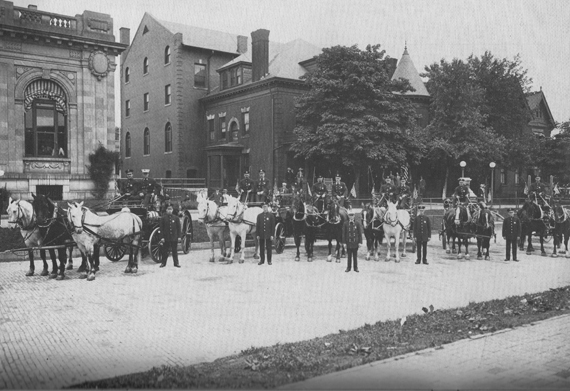 It was under his administration that the era of the horse came to an end in the East Liverpool Fire Department. 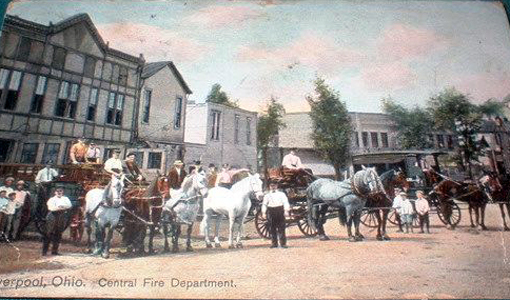 On February 14th, 1914 the Fire Department completed the switch from horse drawn to motorized equipment. This made the East Liverpool Fire Department the first in the United States, to change all at one time. 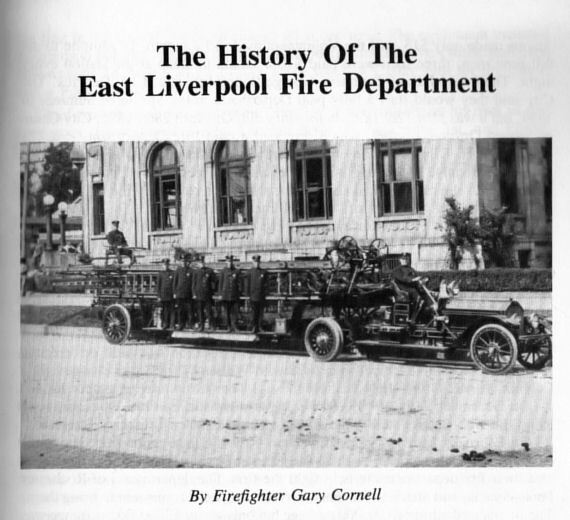 The equipment included a Robinson pumper, capable of going 14 mph up Lincoln Ave., three Robinson hosewagons an American La France aerial truck, a Carter auto for the Chief, and a Ford roadster for line work. Chief Aungst resigned on August 24th, 1916, not entirely on his own as the story goes. He was replaced by Thomas Bryan on September 1st, and Elmer McMillen was named Asst. Chief the same day. The West End Station closed on July 16, 1918, because of the speed the trucks had made it unnecessary. In October 1919, East Liverpool bought a new truck. It was an American La France hosewagon. This was the first Fire Truck in the United States to come equipped with pneumatic tires. On January 16th 1920, the two platoon system of working went into effect. This meant that the men worked 84 hours a week. They worked ten hour day shifts, and fourteen hour night shifts. They got every other Sunday off, when the crew on duty worked a 24 hour turn, and they and the crews changed from days to night turn. In the 1930's this changed to 24 hours on and 24 hours off, on 72 hours a week. February 22nd, 1925, was the date of the next major fire in East Liverpool. The fire destroyed much of the same area that was destroyed in the 1905 blaze. Insurance paid on this Fifth and Market fire was over $435,000. In February of 1928, the City hired thirteen men which brought the force up to twenty six men. In 1930 the new Central station was built on the site of the old station. While the new station was being built, the Fire Department worked out of the old Standard Pottery building, across the street, where Mike Turk Chevrolet is now located. The station opened May 27th, and cost $60,000 to build. On June 5th, 1936 the City laid off nineteen men, leaving only six men on the force. This lasted until January 1st, 1937, when four men returned to work. The Department remained at ten, until April of 1940. The City then hired nine men. Chief Thomas Bryan passed away on February 14th, 1940 after nearly twenty four years as Chief. He was succeeded by his son Charles on May 1st, 1941. This was after a long court battle over the 1940 hirings. Some of the men that were laid off in 1936, went to court because they weren't hired back in 1940. The Court ruled in their favor and the five men returned to work in January 1941. The year 1941 saw the City upgrading the equipment, they bought two American La France pumpers, and one American La France aerial truck. These trucks arrived in October..The aerial is now out of service, and being restored by the Firefighters. Two new Fire Stations were built in 1951, one in the East End at Pennsylvania and Palissey Streets. The other one is in Pleasant Heights, at Lisbon and Belmar Ave. both opened at March 15th. Each cost $26,000. On July 7th, 1957 the three platoon system went into effect. This reduced the working hours to 56 per week. Each man works a 24 hour shift, and then gets 48 hours off. This system is what is in effect now. In 1962 Richard Plumley became the fourth Firefighter to die in the line of duty. This happened on August 2nd, while he was trying to rescue three people from a cesspool on Henry Ave. Plumley and the others all died from the poison gas in the cesspool. The new Seagraves pumper truck delivered in November of that year is dedicated to Plumley. Charles Bryan passed away on January 10th, 1966, after nearly twenty-five years as Chief. Alfred Van Dyne became the next Chief, on February 23rd. Chief Van Dyne saw the Department grow to thirty four men, its highest. The new Northside Station was also built during his time in office. It is at St. Clair and Gardendale Ave. It opened on November 27th, 1971, and cost about $100,000. Two new pumper trucks were also bought in 1971. They are Internationals, and are at the East End and Northside stations. Pleasant Heights got a new pumper for its station in 1975, it is also an International. Two major fires occured during Van Dyne's term. On March 3rd, 1968, there was a large blaze in the Diamond. It caused about $900,000 damage. The other one was the "Heimie's" fire at Sixth and Washington Streets. This fire took place on January 8th, 1974, with the damage going even higher. Chief Van Dyne retired on August 31st, 1977, making him the only Chief to retire from the job. James Pelley became the next Chief on November 4th, 1977. He still serves in this capacity. The Department has suffered, from lay offs and station closings in the last few years. It is now down to twenty three men, and the outside fire stations are opened on a rotating basis, one per day. The new American La France aerial truck was put in service in October 1982, it has a total cost of over $200,000. The East Liverpool Fire Department has been serving the public for about 107 years, the last 88 as a full time paid department. We the members of the Department wish the City a "Happy Birthday", and urge the public to visit our Museum at Central Station. The East Liverpool Fire Department posing in complete regalia with their fire-fighting equipment on Broadway Memorial Day, May 30, 1912. Our thanks to Gary Cornell, retired ELFD firefighter and FD historian for providing the actual date. The second vehicle from the right is the Silsby pumper. Background, left to right: City post office, Masonic Temple, Eagles Lodge.